The study, led by Professor Danielle Schreve from Royal Holloway, looked at an exceptionally well preserved skeleton discovered in Staffordshire in 2002. The team also studied the other remains found with it – including a partial skull of another rhino, nicknamed Howard – to gather evidence on what the environment would have been like at the time. The woolly rhino lived in a rich grassland habitat known as the Mammoth Steppe, when temperatures in Britain were a lot cooler than today. The research, published in the Journal of Quaternary Science used the beetles and midges to show temperatures in summer reached about 10oC on average, but in winter they often dropped as low as -22oC. At that time Britain would have been an unrecognisable Arctic tundra peppered with dwarf shrubs. 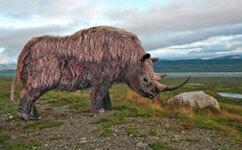 The freezing conditions would have prevented any trees from growing and the woolly rhino herd would have roamed freely, joined by woolly mammoths, reindeer and wolves. 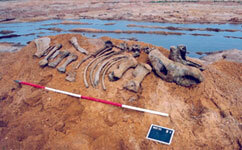 Rhino skeleton laid out immediately after its discovery in the quarry. Previous woolly rhino bones have been found in caves where it is clear the rhinos were prey for spotted hyenas or other predators. The bones are so well gnawed and damaged, they often provide little information for scientists. But this rhino apparently became mired on the edge of a river. 'During cold climate rivers don't meander, instead they have multiple channels, and it would have been quite boggy at their edges. It's not uncommon for rhinos and elephants to become stuck and perish as a result,' says Schreve. The carcass would have frozen quickly and then been buried by accumulating river sediment. Since the skeleton was rapidly buried after its death, it offers Schreve and her team a unique opportunity to study a well-preserved skeleton. 'He was at his peak, a prime individual when he perished. There is no evidence of disease or that he was hunted so that's why we think it was an accidental death,' Schreve says. The skeleton is so well preserved there is still plant matter on the teeth. The team now plans to work on analysing this dental detritus. It will give us a never-before-seen look into the rhino's last meal. 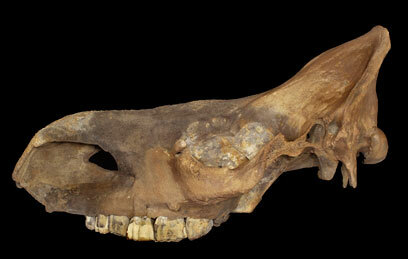 'To have a direct insight into the diet of an extinct herbivore is amazing,' explains Schreve.